SINGAPORE (ICIS)--Spot polyolefin trades in south Asia may remain subdued through August amid uncertainties related to India’s plastics ban and to Pakistan’s upcoming elections. 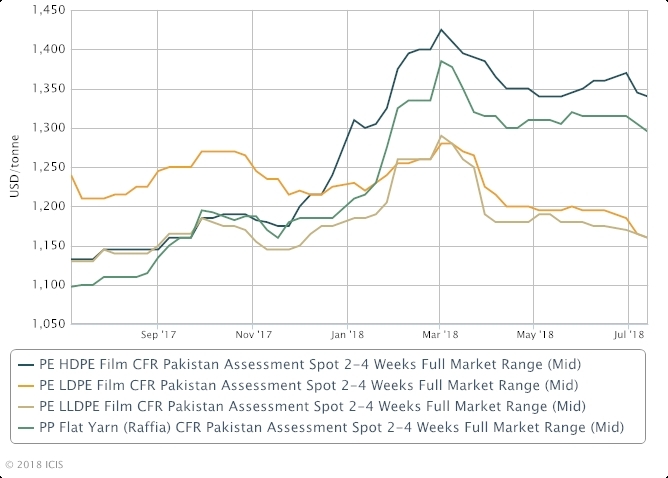 On 13 July, linear low density PE (LLDPE) film prices were at $1,090-1,120/tonne CFR (cost & freight) India, down $10/tonne week on week; and at $1,140-1,180/tonne CFR Pakistan, down $10/tonne at the low end of the previous week’s assessed range, according to ICIS data. 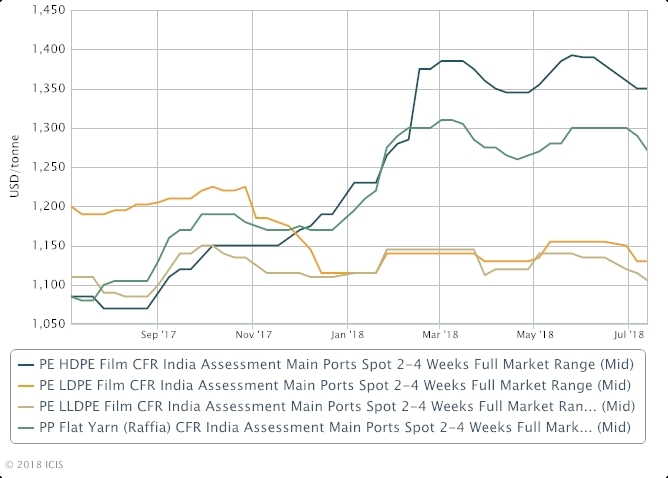 Prices of PP raffia/injection declined $10-20/tonne over the same period to $1,260-1,280/tonne CFR India and $1,280-1,310/tonne CFR India, the data showed. In India, a weak rupee (Rs) against the US dollar continued to undermine bulk PE and PP imports, especially since domestic supply is sufficient to cover immediate requirements. Some PE grades, such as low density PE (LDPE) and LLDPE film, remained oversupplied in the country as most local producers run their plants at near-full rates. Some producers also continued to offer incentives for bulk LLDPE film purchases amid a surplus of local supply, further rendering imports unattractive, an Indian trader said. India turned into a net PE exporter in the fourth quarter of 2017, following start-ups of major local facilities. For high density PE (HDPE) film, local supply has remained tight, as producers were maximizing HDPE pipe production at almost all stand-alone facilities, in view of better margins realised in pipes. Despite the tight supply, spot import prices of the material have been declining since June, weighed down by weakness in the Chinese market. The Indian rupee’s continued depreciation has been worrying traders, which are currently holding stocks bought in April-June at higher prices. The ban on 23 June on use of disposable plastics in the Maharashtra state, where Mumbai is located, has further weakened demand for HDPE film. Mumbai is one of the most populous cities in the country. Maharashtra is the 18th state in the country to announce the ban, with Mumbai now the largest city in India to ban single-use plastics. HDPE film is widely used in the manufacture of plastic bags. Market players expect demand for some PP grades to also be affected by the ban. “PP tubular quenched (TQ) film widely used in packaging, so demand for this has also slowed locally,” an Indian buyer said. Market players have adopted a cautious stance due to uncertainties over the ban’s coverage. “We are still awaiting clarity on what are the items covered under the ban. There are items being excluded from the list as well such as packaging at the manufacturer’s end, so we need to wait till we can have full clarity on what exactly is covered by the ban,” an Indian trader said. In Pakistan, demand for polyolefins has remained largely weak this month ahead of its general elections on 25 July. 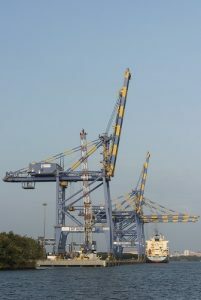 The recent sharp depreciation of the Pakistani rupee (PRs), following the central bank’s call to boost the country’s foreign exchange reserves, has rendered imports expensive. “The market is expected to recover not before late August, by which [time] we can have some clarity on the new government coming into power and its policies,” a Pakistan-based processor said.